I was at my local Nordstrom store, waiting for a sales specialist to grab a couple of products for me, when I saw this and decided to take a whiff. OMG, I fell in love immediately. I mean, I couldn't even put the bottle down. I had to have it right then and there. Normally when I'm fragrance shopping, I like to wear the scent around for a couple of hours before deciding if I love it or not. That was not the case here! I loved the scent so much that it was not an option for it not to smell good on me (thankfully, it smells great on my skin!). 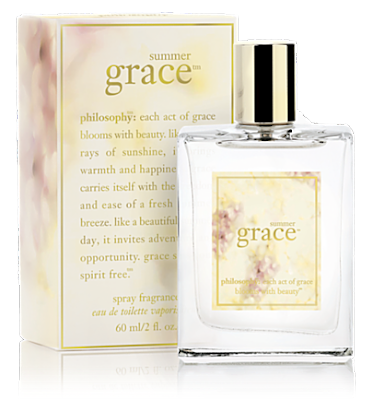 Philosophy describes the fragrance as: "... a warm, bright floral fragrance that makes a woman feel lighthearted, happy and carefree as if she is wearing a beautifully light sundress on a sunny summer day." I couldn't agree more! This scent makes me want to turn into a cheesy fragrance commercial, frolicking around in a flower field in slow motion. 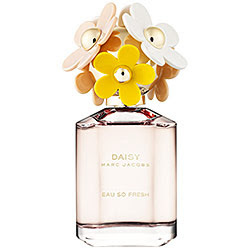 I was already a fan of the original Daisy fragrance, so when I saw the bright summery packaging of the new Eau So Fresh scent, I had to go in for a sniff. And, again, it was immediate. I knew I loved this scent! It's much softer and more floral than the original Daisy, which I found to have a slightly "warmer" feel. Described as having notes of natural raspberry, grapefruit, pear, wild violet, apple blossom, musks, cedarwood and plum, this scent is fresh, playful and bubbly. I like that it's got the musk and cedarwood to ground the otherwise-too-sweet floral and fruity blend. Have you found any new summer fragrances that you absolutely love?